...as cute as a holiday cream puff! Santa Puffs are a Wandering Whimsies original design and these tiny Santa ornaments are completely handcrafted by me. They are available in an large selection of Christmas fabrics (vintage and new) and colors to compliment everyone's holiday decorating. 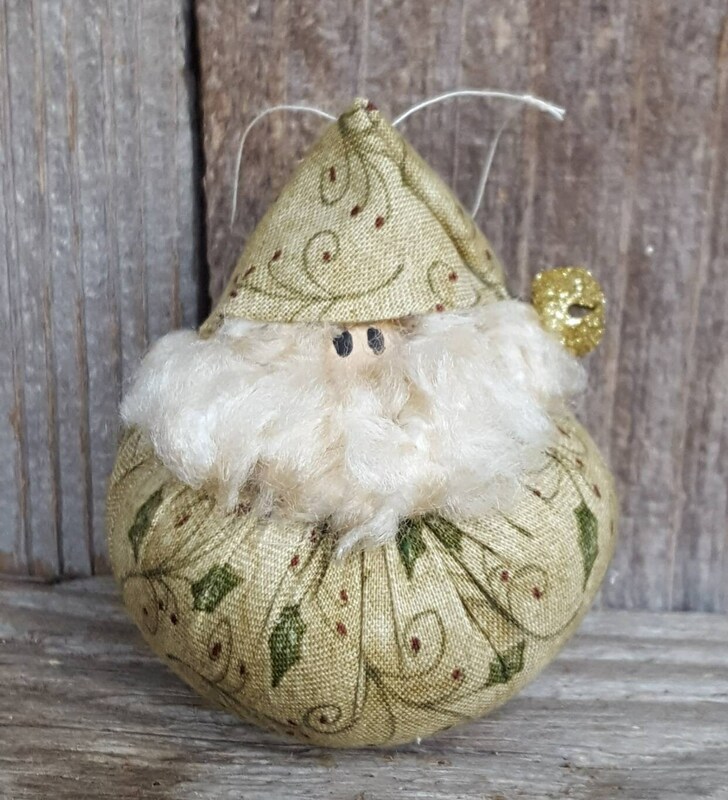 This Santa Puff is crafted from a beautiful holiday green holly fabric sprinkled with red dots. The number of Santa Puffs available in the different fabrics will vary. Once a color is sold out - that's it. Each Santa measures approximately 2.5 inches high (6.35 cm) and slightly more than 1.75 inches wide (4.445 cm). His eyes are black dots of paint. His hair and beard have been fashioned from thick strands of vanilla cream yarn. As a final touch, a small jingle bell (either a rusty vintage looking bell, silver, gold, green, white or red) has been sewn to the point of his hat. A string for hanging on your tree, wreath, swag or attaching to the bow on a gift - is added to the hat. Santa Puffs are great for teacher gifts, ornament swaps, employee/customer gifts and make a wonderful "special extra" touch when added to a package!